Superb. Love the setting in the first image. The eagle photos are so impressive! And I’m sure you’ll have more chances to take photos of the swans. We have thousands here in the agricultural fields, but they do tend to stay towards the middle of the fields, away from the roads. One needs a good long lens and a tripod, neither of which are in my proverbial bag. Each of us concentrates on certain things, and you photograph birds (and flowers!) superbly. Thank you Lynn! I usually have my tripod along, but sometimes there isn’t enough time to use it, unless the birds stay in one place for some time. You do well with and without the tripod! WOW!!! 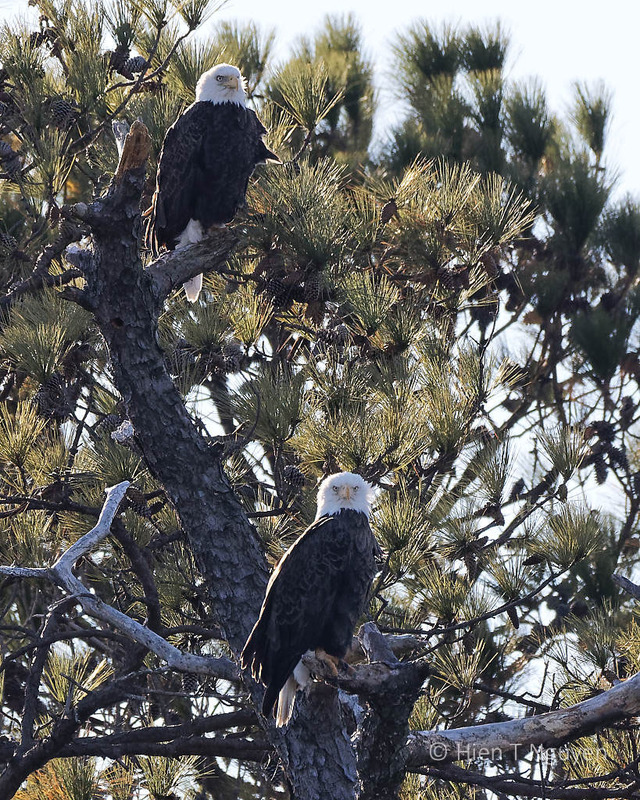 What great shots of those eagles! Wonderful captures, Hien, I am glad you made it to Blackwater! 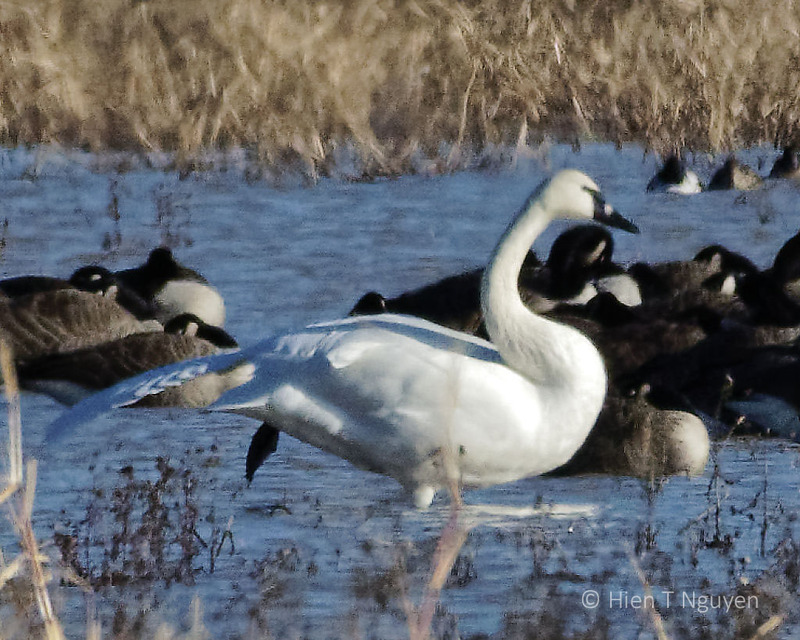 I’ve slipped over there again and saw maybe 30-40 TSwan off in the distance as well. Hopefully, more will arrive soon and stay the winter around there and Eastern Neck, where I’ve had better luck seeing them up closer at. Thank you Donna! I will go back to Eastern Neck in December or January, weather permitting. Love the eagles. What magnificent creatures. Why are they called “bald” if they are not actually bald, or does “bald” mean someting else? 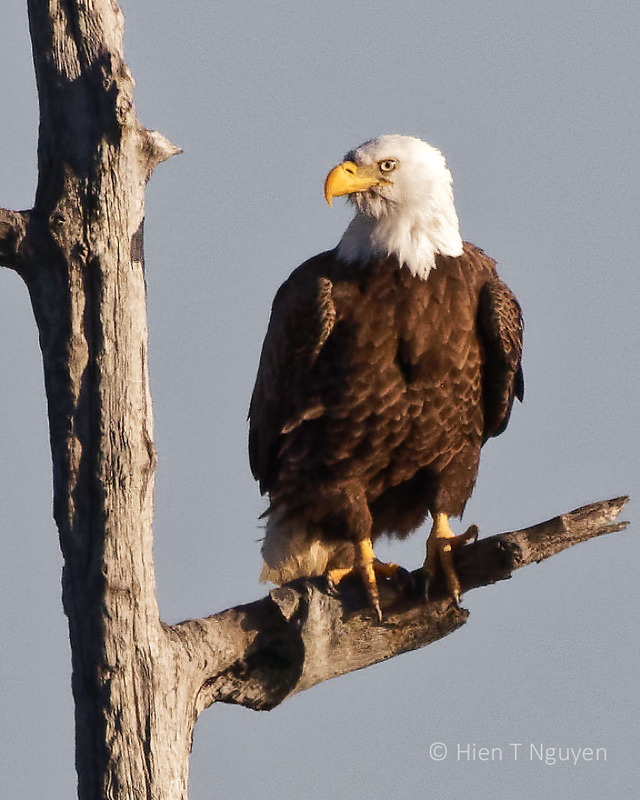 When a Bald Eagle reaches maturity, at about 5 years of age, the top of their head is fully white, giving it the “bald” look. 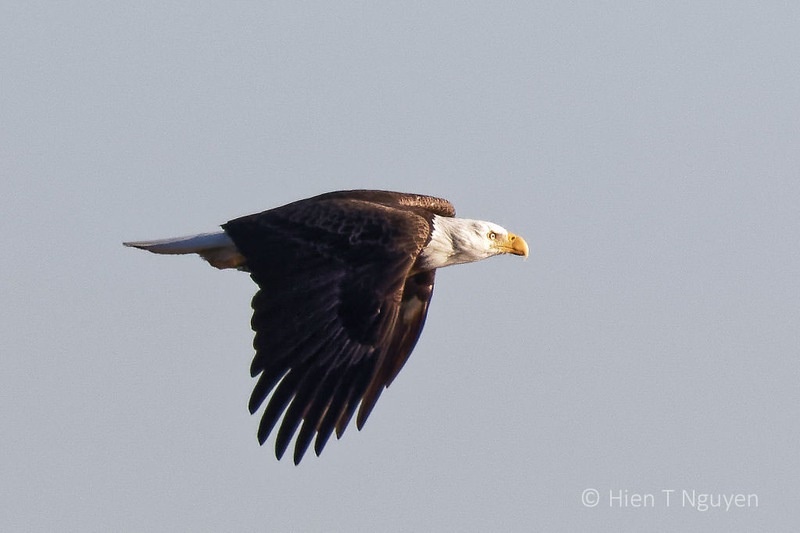 Younger eagles gave brown head, becoming more and more speckled with white as they age. Oh! Thank you for explaining that to me, Hein. The eagle pictures are fantastic. 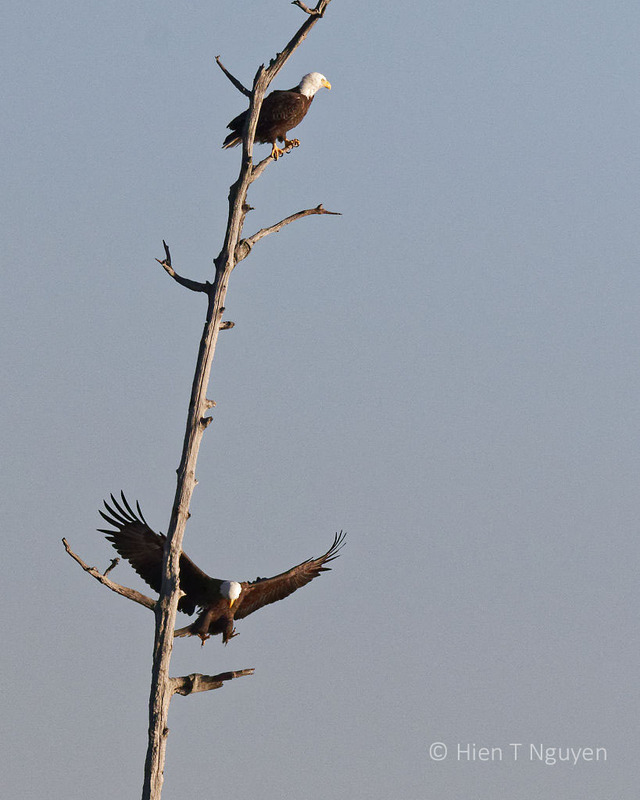 I like the ones in flight, but also the ones where the pair is sitting in the trees is really fantastic. Thank you! Glad you like these photos! Sorry to hear of the potential lack of funding for a national wildlife refuge. 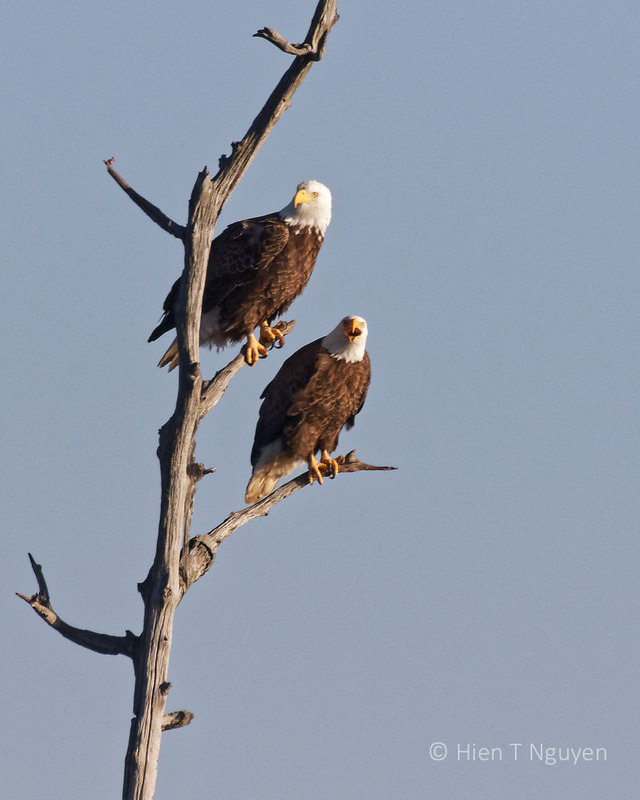 Loved the eagle photos. 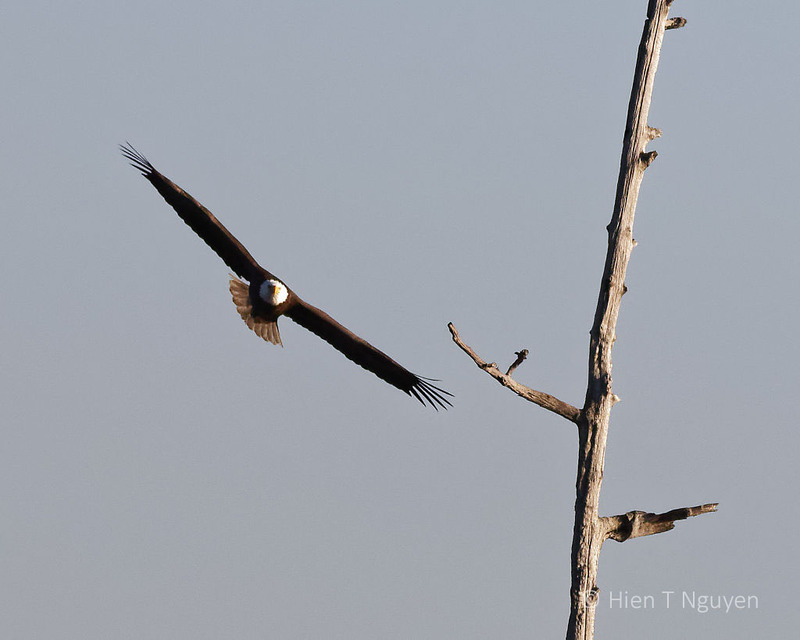 Excellent images of the eagles, both perched and in flight! 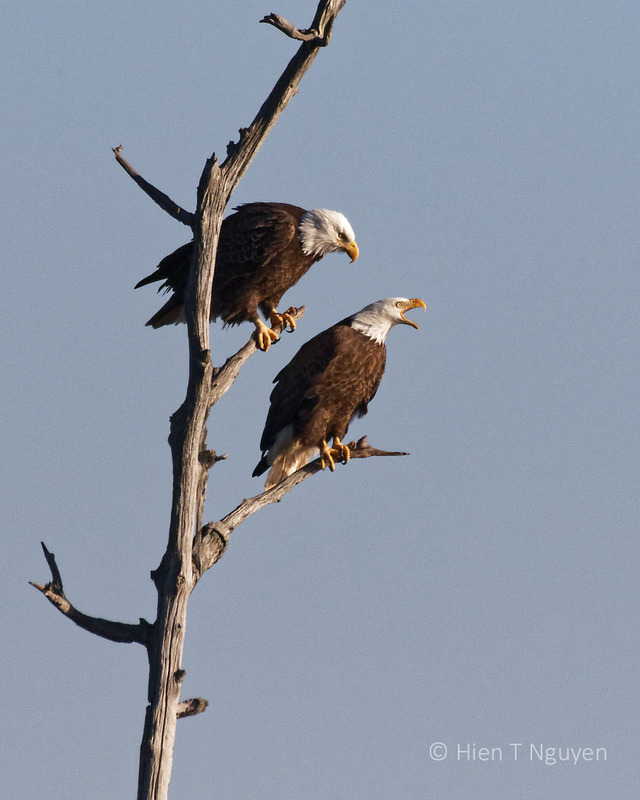 here so many questions that I have about their behavior, such as how mated pairs are able to find each other when they often hunt miles apart from one another, and why do they call, even when their mate is nearby. Sorry for the rant here, but we have several National Wildlife Refuges that are closed in Michigan due to “lack of funding”, and I think that it’s all nonsense. The feds own the land and don’t sell it when they close a refuge, they only close it to the public to prevent us from seeing the wildlife there. I don’t understand why there have to be employees there, or any of the other rules and regulations that go with these refuges, other than it will be used in the long run to extract more money from the taxpayers in the form of fees, or to simply place more of nature off limits to the public. Again, sorry for the rant, you may edit this post to cut that out if you wish. Thank you for you comments, Jerry! On the subject of fees, I think sooner or later they will have to be increased. Even with more government funding, in the end it still comes from us in the form of taxes. At Eastern Neck NWR, private groups have already donated money to rebuild walkways and some buildings. But salaries for employees is probably the biggest burden. At Blackwater, many people work there as volunteers. They are retirees, but park rangers must be younger and well trained, and must be paid for. There is no easy solution. 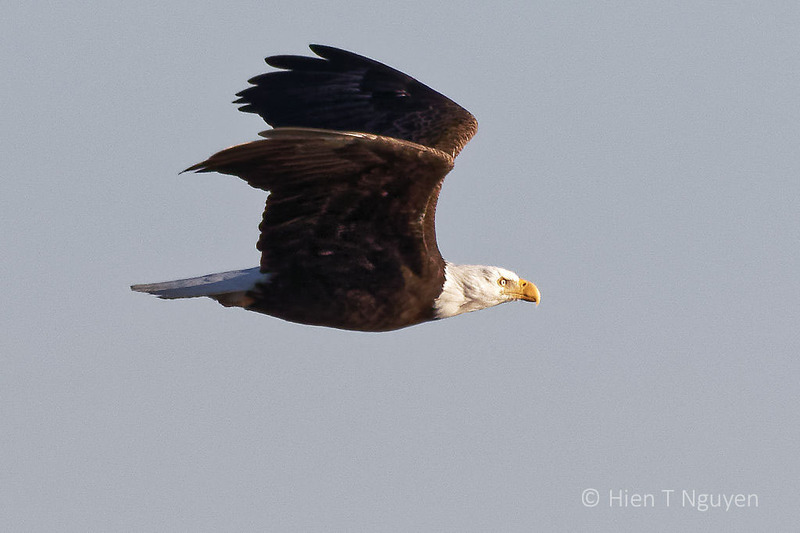 Shocking to hear that a wildlife refuge may be lost due to lack of funding, Hien! There’s so few areas left for wildlife to begin with! As it is, all the refugees benefit from volunteer work done for free by some people who live in the area, from greeting visitors to weeding and helping with light chores. 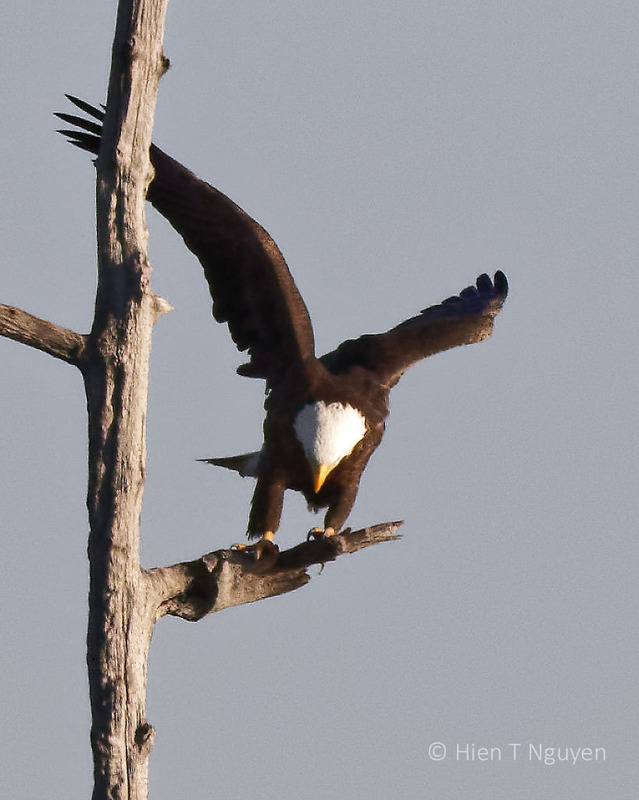 At Eastern Neck NWR, private donations have paid for some reconstruction and maintenance work. I can see the day when entrance fees will be increased dramatically in order to maintain the refuges. We should all get out often and capture more of nature’s beauty with our cameras! 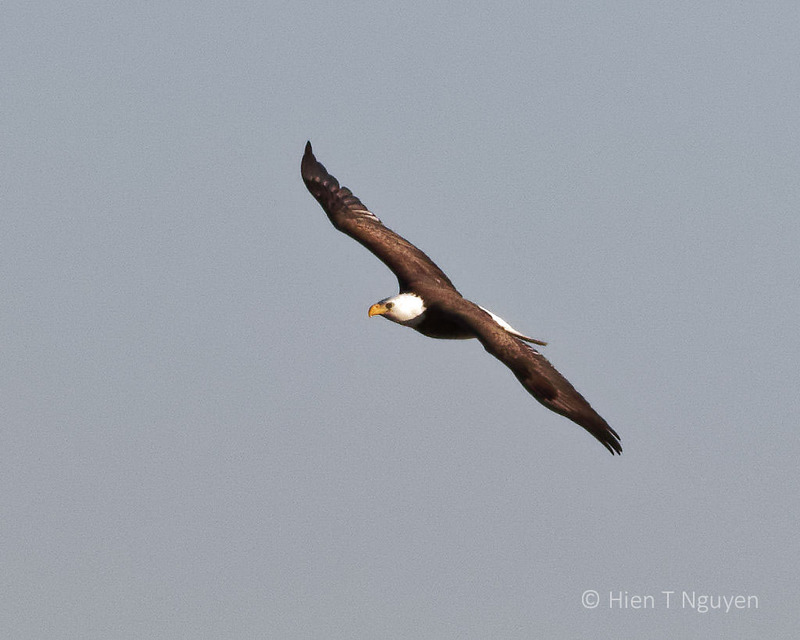 Nice Eagle flight series, Hien. They really are majestic birds.